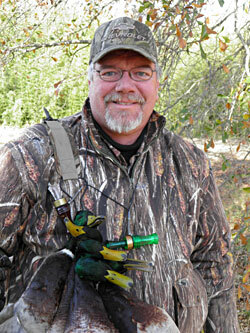 Over the past few decades I have had the good fortune of hunting waterfowl in dozens of states and many locations. I have studied the layouts, observed the techniques and learned what it takes to build a high quality duck hunting haven. The basic principles to creating such a spot are pretty obvious in retrospect however there are very few waterfowl set-ups that incorporate all of these factors. And that is the key. Build all of the following pieces into your project and it will be successful. FOOD AND WATER: Most waterfowl hunters will agree that a top duck blind must be built on water. This theory is very relevant but water is NOT the most important part of attracting ducks and geese. Food is. I have been in some incredible duck blinds on lakes, rivers, ponds, sloughs and pot holes. These places looked to be perfect but no ducks used them. The fact is that no amount of water will make up for a lack of available food. 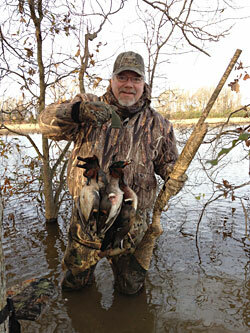 A food source is the key to success in attracting waterfowl. I have personal, local experience of what happens when all the grain fields in the bottom get chisel plowed before duck season opens. Our pot hole is virtually perfect in its construction and concealment. This makes little difference when no ducks get close enough to see our decoys. From the altitude that ducks fly they can see thousands of acres. They are looking for what I call �Yellow ground�. Harvested grain field appear yellow from the air. I have flown in the fall and I have seen exactly what the ducks see. Yellow fields attract their attention to fly low to see if food is available there. If your set-up is in or near these fields you have a chance to get them to work your spread. If your spot is surrounded by tilled, plowed or cultivated fields your chances drop-off significantly. Waterfowl just do not spend time in �Black ground� areas. Black ground will not attract ducks or geese. Do your best to have Fall plowing delayed as long as possible around our blind. Now for the GOLD STANDARD set-up advice. Put your blind or pit in the lowest spot in a grain field. Pay the farmer NOT to harvest an acre or two around the blind and install a pump and flood the low spot. Even though this takes some work and is not cheap, it is the BEST way to build a waterfowl hunting set-up that will be the envy of everyone who sees it. There is NO BETTER waterfowl attractant in our area than flooded standing corn. CONCEALMENT: This tends to be a bit of a controversial topic when it comes to duck blinds. In my opinion there is only one factor that should be considered when brushing a blind. That factor is, �What can the ducks see from where they are?� Far too many waterfowl hunters cover their blinds so that they look good from their prospective, from the ground. All-too-often the top of the blind is covered but not fully inspected for bad spots. Be sure to give special attention to the top of your pit or blind. This is what the waterfowl see. The material is also very important in your concealment process. The most common mistake is to brush your blind with foliage that is not natural to your location. I have been in blinds built in the middle of rice fields in Arkansas that actually flared ducks because they were covered with oak limbs. That is a very unnatural look for ducks. God did not give birds the ability to think and reason. They can only react to stimuli. That ability is called �instinct�. Their instinct tells them if a given situation is good or bad. Seeing a pile of oak brush in the middle of a rice field is negative stimuli and they will naturally react in a negative fashion. Use the naturally occurring cover to conceal your blind or pit. Cover your spot completely and take the time to make sure it blends in to its surroundings. If you are lucky enough to have a pit like I described above, in a corn field, then cover your spot with corn stalks. If you are on a river bank, use willows or cattails. If you are in flooded timber, by all means use oak limbs. Just be smart and try to always imagine what the ducks can see from up there. MANAGEMENT: This is, by far, the most difficult factor in building a highly successful waterfowl program. 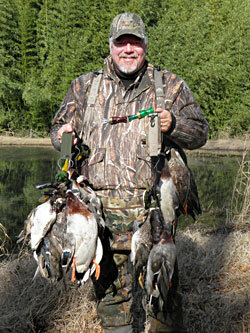 To get the very most out of your waterfowl set-up, DO NOT hunt the blind every day. In fact, I recommend not hunting it two days in a row. When ducks are pouring in it is hard to do this and even harder to convince others that this level of management can produce more dead ducks than hammering them relentlessly. There must be a level of �refuge� that the ducks and geese can count on to keep them coming back to your spot. Another good idea is to stop shooting at noon on hunting days. This gives the ducks every afternoon to rest, feed and stay very comfortable around your blind. The analogy I use is like deer herd management. It seems odd that you can grow more and bigger bucks by shooting female deer, but it is a proven fact. Another proven fact is that you will kill more ducks and geese longer by NOT hunting them every day. The factors listed above are the magic potion for a successful waterfowl program. Follow them and you will become a more productive hunter. Ignore them and continue to wonder where the ducks have gone and why you cannot seem to scratch-out a limit more than once a year.